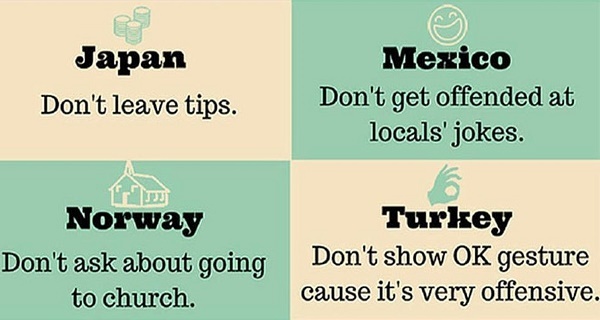 This list of 18 things not to do overseas is perfect. In France, it's considered impolite to ask about money. In Germany, people believe that a person may not live to their birthday if congratulated early. In Turkey, the "okay" gesture is seen as offensive. In China, clocks and umbrellas are seen as bad luck when offered as gifts. What are some of your overseas faux pas observations?